The AT&T 1080 telephone is hearing-aid compatible and can be connected to up to 4 incoming telephone lines. This telephone features a speakerphone for handsfree use and a headset jack compatible with most two-band 2.5mm headsets (sold separately). There are two additional ports available for connecting the telephone to another device such as a fax machine or modem. The AT&T 1080 allows paging, intercom and call transfers between system telephones and is capable of connecting three parties in the same conference call. This telephone also features a 32-number one- and two-touch memory for faster dialing and has a directory which can store up to 200 additional numbers with names. The 1080 also features a built-in digital answering system which can store approximately 60 minutes of messages, memos and conversations or a total of up to 99 messages. 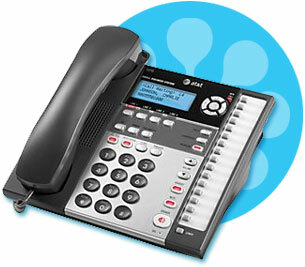 You can access the answering system from a remote non-system touch-tone telephone or from another system telephone. This AT&T Small Business System is expandable to a 16-extension telephone system and is compatible with the 1040 and 1080 telephones. The 1070 telephone is hearing-aid compatible and can be connected to up to four incoming telephone lines. This telephone features a speakerphone for handsfree use and a headset jack compatible with most two-band 2.5mm headsets (sold separately). There are two additional ports available for connecting the telephone to another device such as a fax machine or modem. The 1070 allows paging, intercom and call transfers between system telephones and is capable of connecting three parties in the same conference call. This telephone also features a 32-number one- and two-touch memory for faster dialing and has a directory which can store up to 200 additional numbers with names. This telephone has a caller ID feature which supports caller ID with call waiting service. The 1070 telephone is compatible with Centrex service. This AT&T Small Business System is expandable to a 16-extension telephone system. The 1040 telephone is compatible with 1070 and 1080 telephones. The 1040 telephone is hearing-aid compatible and can be connected to up to four incoming telephone lines. This telephone features a speakerphone for handsfree use and a headset jack compatible with most two-band 2.5mm headsets (sold separately). There are two additional ports available for connecting the telephone to another device such as a fax machine or modem. The 1040 allows paging, intercom and call transfers between system telephones and is capable of connecting three parties in the same conference call. This telephone also features a 32-number one- and two-touch memory for faster dialing. If there is a 1080 telephone in your system that is an auto attendant, it may record messages for your set. The 1040 telephone is compatible with Centrex service.